But now, thus says the Lord , who created you, O Jacob, And He who formed you, O Israel: “Fear not, for I have redeemed you; I have called you by your name; You are Mine. When you pass through the waters, I will be with you; And through the rivers, they shall not overflow you. When you walk through the fire, you shall not be burned, Nor shall the flame scorch you. For I am the Lord your God, The Holy One of Israel, your Savior; I gave Egypt for your ransom, Ethiopia and Seba in your place. I shared earlier this week on Nine Reasons You Can Trust God from these three verses. 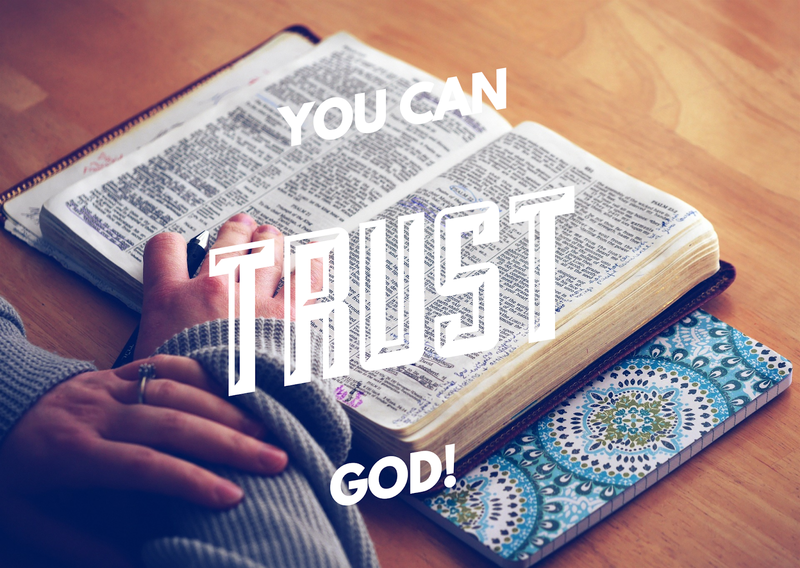 In part 2 of You can trust God. We are going to begin in verse 4. You are precious. Precious is prized and valuable, you have been appraised and stamped valuable, priceless, esteemed, and costly. The world, culture, and others around you may have said negative, mean, angry, and hurtful things to you and about you. But in the eyes of God you are Precious. You are not who the world calls you. You are who God calls you. You are not who the world sees you as. You are who God sees you as. For further encouragement on this read, meditate, and declare 1 Peter 2:9 over your life. My goodness do we even need to go any further in the text YOU CAN TRUST GOD!! God loves you so much, He gave His own Son for you on the cross. If God didnt withhold His Son. He will not withhild any good thing from you. YOU CAN TRUST GOD!! Jesus Christ loved you so much, He paid a debt for you, that He didn’t owe and that you couldn’t pay. Jesus gave His life on the cross and became sin so you could be the righteousness of God. He gave His life so you could receive eternal life. Fear not is a command, accompanied by promises. By outward circumstances, the people of Judah had reason to be afraid of Babylon’s army and exile. God points them past the present circumstances to both this command and promise. No matter how far you seem from God right now. No matter how far away your answer seems to be. By the blood of Jesus Christ those who are afar off are brought near. By the blood of Jesus all the promises of God have been made availble to us. God can save you. God can save your family. YOU CAN TRUST HIM!! You are called. You have a purpose. God has created you for His glory. You carry His name in the earth today. You are His child. You were created for greatness, you were predestined to declare God’s workmanship in the earth. Gather the whole world together and see if any one compares to God. No one but God can do the things God does. Just in case you need another reason to trust Him. You can trust Him because He is God. He alone is God, He is Savior. He is Jehovah. His power is limitless. His reign has no end. No one compares to Him. His Word is just that His Word. God is able to turn your circumstances around, but no one can reverse what He has already accomplished. He makes a way out of no way. He can part the rivers and open the seas so you can cross over. He reigns over the flood so He can lead you through the flood. He will defeat and destroy every enemy. He will silence every lie. He will bring down every work of the wicked one. He will quench every fiery dart of the enemy. Every knee will bow and every tongue will confess that Jesus is Lord. See you must understand in chapter 42 Jacob had been disobedient and would not heed the voice of the Lord. You may have failed God. You may have really messed things up in your life. God is a forgiving God. He is a covenat God. He is slow to anger, merciful, and ready to pardon. Don’t allow your yesterday to hold you back from trusting God today. His mercy is new every morning. Where sin does abound grace does much more. Today is the day of salvation. Today God wants to do a new a thing in your life. New hope, new joy, new peace, new mercy, new anointing, and a new plan and purpose. Trust God in your today no matter what happened yesterday. Shall you not know it? I will even make a road in the wilderness And rivers in the desert. The beast of the field will honor Me, The jackals and the ostriches, Because I give waters in the wilderness And rivers in the desert, To give drink to My people, My chosen. This people I have formed for Myself; They shall declare My praise. Jesus is declaring to you today. Trust me in your wilderness for I will make a way out of no way. Trust me in your desert for I am the Living water. Believe in me in your desert and out of you shall flow rivers of living water. God formed you. He knows you. He loves you. He has created you to fulfil His purpose in the earth. He alone is God. He is in control. You can Trust Him!! !